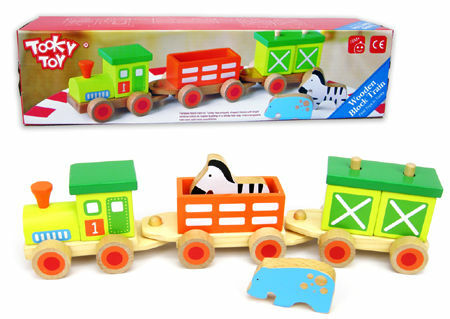 Wooden Animal Block Stacking Train is a beautifully made push along train with 2 carriages and 2 sturdy removable animals. This solid wooden toy can be played with in many ways as the last carriage is a stacking toy with 2 removable blocks and a single rectangular piece for the roof. These pieces are placed onto 2 wooden uprights. The 2 animals fit side by side into the second carriage. A very well made toy which combines stacking and sorting with lots of train driving and rolepaly opportunities... All aboard! Size: 38cm long x 10cm high x 8cm wide. Material: Wood Child safe paint. We like this because: "Great multi-purpose toy and very strong."